No one ever told me that all the things that we had been teaching our children – to work independently, to think critically, to be responsible – would come back to bite us. Literally. Earlier this year our daughter, age 9, started making noise about wanting a pet. We have previously had fish who, unfortunately, lived a very short life. Taking a page from a friend's book, I told her to start researching and learning all she could about the animal that she wanted. This turned into multiple trips to the library where she checked out every single book in the pet section (which turned out to also be a wonderful lesson on the Dewey decimal system!) before finally narrowing down her selection to guinea pigs. I kept suggesting a worm farm but that didn't excite her. Her response? They aren't very cuddly. Indeed. 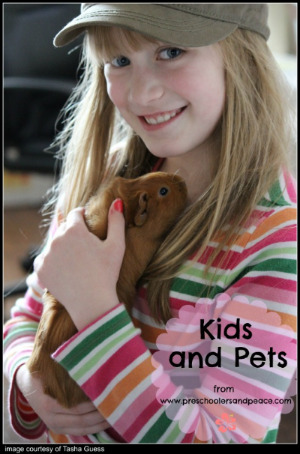 After she decided guinea pigs were her pet of choice, she learned everything about guinea pigs that she possibly could. She read books. She researched online. She talked to people that had guinea pigs. She asked her daddy to take her to the pet store to see them on their daddy-daughter dates. Without any prompting she could give a ten minute presentation, including visual aids, on guinea pigs. It was like she was defending her dissertation. The girl knew her stuff. We were outwardly proud of her and inwardly hoping her desire would go away. No such luck. At the end of October, my husband and I decided that our daughter had shown that she was sufficiently prepared to be a pet owner. We contacted some friends who used to raise guinea pigs and they gave me the number of a lady who does guinea pig rescue. Guinea Pig Rescue? Who knew?? Theresa prepared her list of questions and called the rescue lady to set up a time to visit. After visiting, Theresa was 100% determined that these would be her pets. She carefully selected all the items that she'd need for her pets and bought them with her own money. Autumn and Callie Guinea Pig now live in our school room and very happily eat the wilted spinach and carrot scrapings from the kitchen, along with hay and pellets. Our daughter has learned that it takes a LOT of time to care for her pigs. Feeding and watering isn't a problem, but they are poop machines!! Changing their cage and cleaning up after them takes a significant amount of her free time. Let me be completely transparent. I was not excited about getting rodents; however, I knew it was important for our daughter to have the opportunity to have pets of her own. She already had shown us that she was responsible for taking care of herself and her regular chores. She has really proven that she can handle the additional responsibility. My husband and I do nothing to care for them, except occasionally take them out to play after the kids are in bed! Now that my oldest daughter has a pet, the other children are starting to clamor for pets. We have given them the same requirements – show us you can be responsible, do your research and save your money. Let me just say, I'm very grateful that we live in the city and therefore have restrictions on the type of animals that we can have! Does your family have pets? How do you handle the care and keeping of them? What's the strangest pet you've ever had?